Have you been going through a lot of DIYs to find ways to amp your everyday look this summer? We say, witness ‘em styling tips with Niki Mehra with your squad IRL. 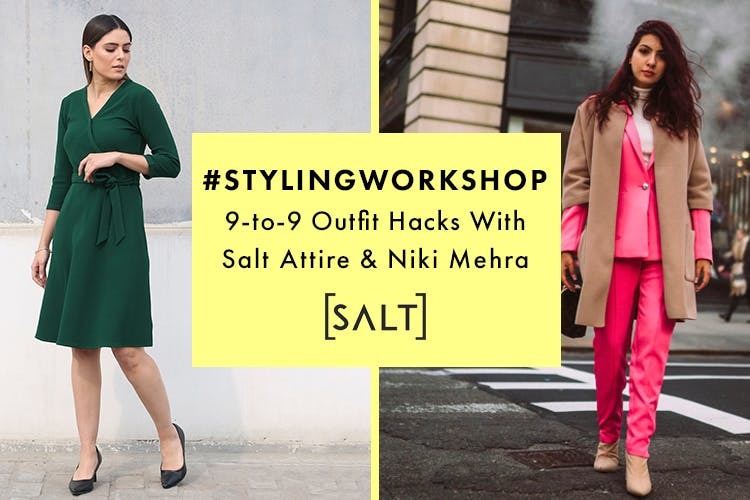 Learn 9-to-9 Outfit Hacks where you will get a chance to learn quick hacks for easy day-to-night dressing using Salt Attire and Mul Mul’s range of clothes. Best part? You will get insights into quickly slipping from that day work look into a fun evening look perfect for an outing with friends (or a date night). Ladies! If you like to stay on top of your outfit game, then this workshop will keep you wanting for more tips. That’s not all; you can even hit them up with questions about the top that has been idly looking right back at you in the eyes ever since you bought it. Imagine a day of shopping where you can learn how to style your formal/semi-formal dresses, tops, shirts, pants and skirts while you shop, experience and chill. You will even learn how to pair accessories such as belts and jewelry with those summer outfits to pep up your look instantly. Niki Mehra and the stylist will help you get your power dressing game on! Get ready to amp up your summer wardrobes with the best of collection from Salt Attire, Mul Mul and other brands all under INR 7000. AND, stock up on all your coffee needs with the smart coffee maker - É By NESCAFÉ. Take a break from all the shopping and enjoy chilled beer under the sun, thanks to our beverage partners, Kati Patang! Register for the workshop for free by hitting the red button and filling out a quick form.